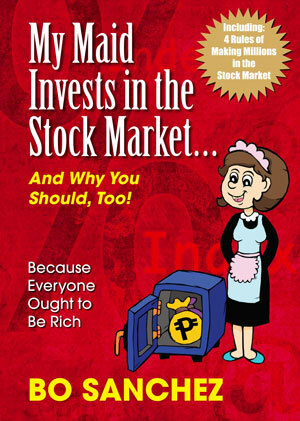 Saving in mutual fund is now mandatory to all Overseas Filipino Workers. Before we are able to get our OEC, we need to be a member Home Development Mutual Fund or most commonly known as PAG-IBIG. Some OFW's think that this saving system is another money making business for the Philippine government. Some will just comply and be a member just to get their OEC, but never funded for their PAG-IBIG Account. Some OFW's take this as additional expense to be included in their monthly budget. An OFW mentality that should be corrected. PAG-IBIG overseas program is mandated by law to prepare for your retirement and you can have an opportunity to own our own house. There are many OFW's after more than 10 years of working abroad still don't have their own houses. 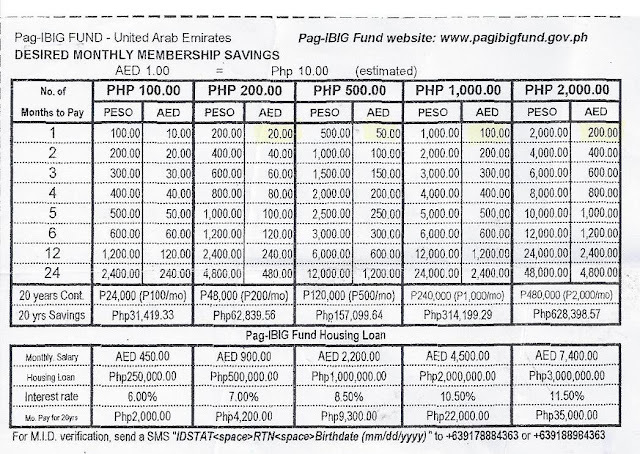 Here are some more information you need to know about PAG-IBIG Fund. What Philippine Law covers mandatory PAG-IBIG membership of OFW's? What are the benefits of PAG-IBIG members? 1. 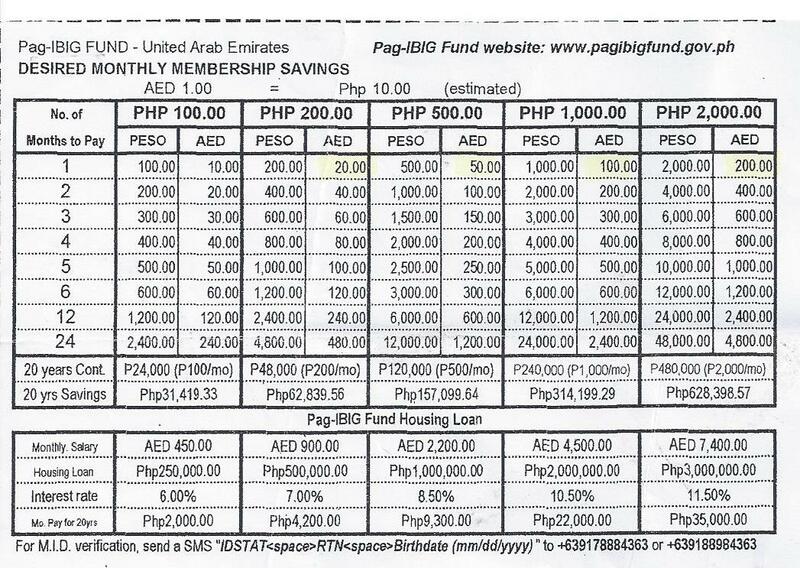 Guaranteed savings by the Philippine government for your future. An active OFW member of PAG-IBIG can easily avail the housing loan. A member should have at least 24 months contribution to avail the housing program. Members can apply up to Php3,000,000 housing loan depending on the monthly contribution, with low interest rate and low monthly amortization for 20-30 yeasr. Please refer to Table 2 provided above. Housing loan may be used for the purchase of residential house and lot,condo units, townhouse, construction or completion of residential unit on a titled lot owned by the member and home improvement. The big issue of all kabayans, how or where to start? Visit the Abu Dhabi Philippine Embassy and go directly to the first door on your left upon entering the embassy main entrance. Fill-up the PAG-IBIG Application form. Our kabayans will be assisting you there. After submitting the accomplished form with your original passport, they will give you your OFW PAG-IBIG Account Number. Kalas! You can now start saving your hard earned money. You can deposit it through UAE Exchange, Al Ansari, Al Falah Exchange, Al Ahalia Exchange. I am an OFW and have an existing housing loan. I bought this last 2010-January starting of my equity period and by November 2014, i will finish the first three years paying in Pag-ibig using my post dated check and the title will be transferred in my name and also others fees will be personally paid by myself. Before it was paid thru the developer and after paying 3 consecutive years, i will be the one who handle and pay this personally. What will I do if I am here in other country? Do I need to make a SPA for this? Or need to go back to Philippines to personally handle this? Please need your good assistance to settle this. this is awesome! i was looking for a good and informative post regarding in that matter. it actually open myself about everything that i want to know. thank you and god bless.